– Put the chicken breast, fish sauce, lemon grass purée and ginger in the bowl , mix well and leave it to marinate in the fridge for at least 1 hour… even better overnight. – Pre heat the oven at 200 degree Celsius. – Put the marinated chicken on the baking tray. Drizzle with honey on the top on each chicken breast. Then put the chicken in the oven to cook for approx 45 minutes. – To make the salad dressing , put soy sauce,ginger,red chilli, honey in the mixing bowl and mix well. – Fry the garlic in the coconut oil. Please keep an eye on it, as the garlic is easily burnt. Take of the heat as soon as the garlic turn to golden colour.Then put the oil in with the salad dressing. -Cook the rice vermicelli according to the instruction on the package. Drain the excess water out, once it’s cooked. – Toss the rice vermicelli together with the salad dressing. 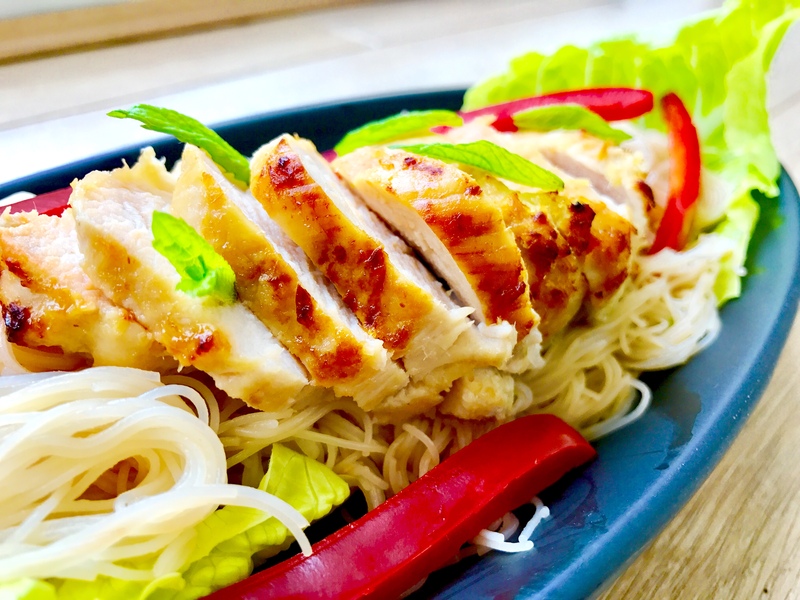 – Sliced the chicken breasts and lay them on top of vermicelli. 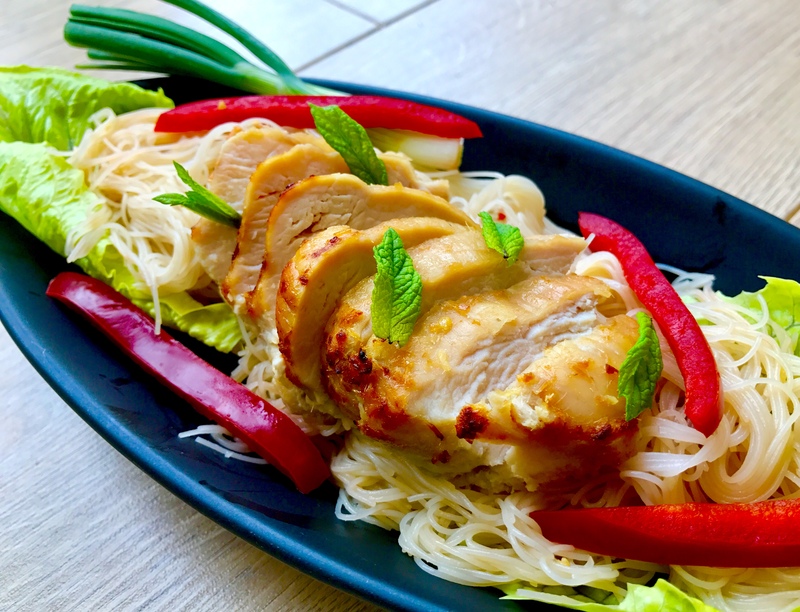 Serve Warm Chicken With Sweet And Salty Rice Vermicelli Salad with a Roman lettuce leaf , mint and spring onion to garnish. Enjoy. Add chopped peanut onto Warm Chicken With Sweet And Salty Rice Vermicelli Salad for extra crunchiness.